So you want to produce a short film. Or design a new line of jewelry. Or manufacture a revolutionary solar-powered garden sprinkler. There’s just one catch: You need $100,000 to bankroll your dream, and your checking account has barely enough to cover the rent. 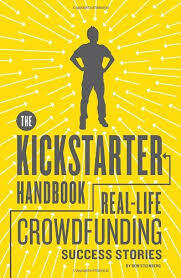 Enter Kickstarter.com—the phenomenal “crowdfunding” website launched in 2009 that brings venture capital to the masses. At Kickstarter, it’s not uncommon for entrepreneurs to raise $50,000, $100,000, $250,000, or more. All you need is a great idea—and The Kickstarter Handbook. Business journliast Don Steinberg has interviewed dozens of artists and inventors who launched their passion projects online. Through their voices, you’ll explore all the strategies of a successful Kickstarter campaign. You’ll learn the elements of a compelling Kickstarter video, innovative ways to market your projects, tips for getting donors onboard, and the secrets of irresistible Kickstarter “rewards.” You’ll also discover what to do in a best-case scenario—when your project goes viral and the cash starts flowing in. On Kickstarter, it happens to a few lucky visionaries every week. Here’s how to be one of them.